Hi there! My name is Bailey and I’m a senior at Hope College. I am here completing my social work internship in Chicago! Since moving to Chicago I have loved my time learning how to navigate this big city and get the most out of my short time here. Going to school in Holland, MI is very different from Chicago, and it has taken me a moment to figure out some of the basics of city life, like navigating public transportation, finding a new church, and a community of friends. Thankfully Chicago Semester was so helpful with all of this! During orientation, we were given lots of helpful advice on how to take public transportation, and I have gained many friends from the program. I love living in Canterbury Court Apartments because it is where a majority of the students live in the program, and it has made it so easy to spend time together after a long day of work. My roommate and I often make dinner in my apartment and carry it up to the 5th floor to eat alongside our good friends that share an apartment up there. It’s such a great opportunity to unwind after a long day and connect with the people experiencing city life for the first time just like me. My friends and I will often go exploring on the weekends to find some new great food spots, or unique coffee shops. For example, we went to Broken English this week (a tex-mex restaurant in Old Town) to get some amazing tacos. 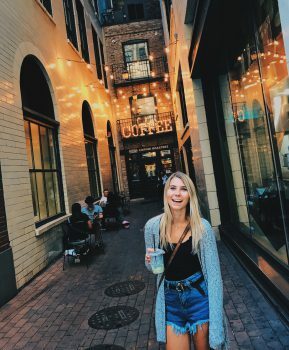 And last week, my friend and I had some down time so we went to a coffee shop near State Street called Hero Coffee, where the only seating in in a cute alleyway lit by string lights. There is always something to do here, no matter what the hour. I love being able to run downstairs to the CVS across the street if I’m in need of a late night snack or a phone charger at 11pm. The location of our apartment is so perfect and has allowed for me to go to the beach (3 blocks away) regularly, whether I am laying out, going for a run on the lake-side path, or just spending some alone time by the water, it’s the best place to be. I also spend a lot of time at the little park just down the street from the apartment (across from Velvet Taco and Urban Outfitters). This little park in between many restaurants and shops is always popping with people. It is the best spot for drinking coffee and reading a book, or grabbing ice cream with a friend. It’s lit up with cute string lighting and has a beautiful fountain which you’ll find many people gathered around at any time of day. Another part of navigating my time in Chicago, is learning how to take on an almost full time internship. Doing the 9-5 gig 4 days a week is definitely a big switch from my life back at school. It can be tiring, but it’s also such good practice for what life will truly look like after college. 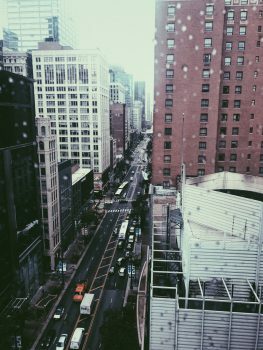 In choosing to do the Chicago Semester, I was mostly drawn to the idea because of how closely the experience would relate to real life in the field after school. By choosing to do social work in the city, I see a lot more action, I am able to see kind of the worst of the worst cases, which is a good way for me to try it out in full force! I also am able to experience the daily rhythm of being in an office almost daily and thus I feel like I am respected and accepted as part of the team by my coworkers and clients. I intern with an agency called SOS Children’s Villages which is a foster care agency that keeps sibling groups together. Each location of the agency has apartment buildings that are owned by the agency where the children are housed with our trained and hired-on foster parents. I work under the case workers in the agency, meaning that I assist them in retrieving information on our children in order to further their case, attend home visits with the children and also with biological parents to discuss progress, and attend court hearings as well. This has been a really awesome hands on experience for me to get a better idea of what being a caseworker would look like if I decide to be one! My supervisors are very accommodating and flexible, allowing me to have a say in how I wish to spend my time while I work here. I have expressed to them that I would love to sit in on some of the therapy seasons that the kids attend as well in our clinical offices and they have been super accommodating by allowing me to sit in on a few sessions! As I continue to work here at SOS, I learn more and more about being a successful case worker, and social worker. My favorite part about my job is spending time with the kids in their homes, and when they come into the office for therapy and parent-child visits. It is so exciting having the opportunity to try out all of the things I learned in my social work classes like active listening, cultural competence, and using strengths perspectives with my clients. I would highly recommend doing your internship in the city too!